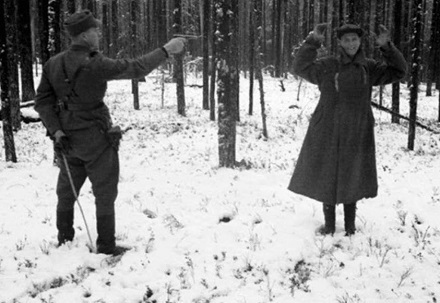 The last executions in Finland occurred on this date in 1944, claiming the lives of three Soviet spies who had been parachuted behind Finnish lines. I have been unable to locate the names of these men. They’re invariably presented simply in connection with — or as the denouement following — the September 2 execution of Finnish deserter Olavi Laiho. The next morning (Russian link), Finland announced its disengagement from its problematic German alliance, an arrangement brokered by the western Allies who wanted to keep Finland democratic and non-communist despite sitting in Russia’s back yard and joining the wrong team in World War II. The Soviet Union immediately redeployed its forces away from the Finnish theater; a formal armistice was signed before September was out and prisoner transfers began in October. Finland abolished the death penalty for all peacetime crimes in 1949, for all crimes full stop in 1972, and wrote the abolition into its constitution in 2000. 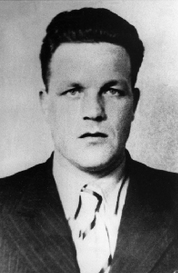 Olavi Laiho was the last Finn executed in Finland, on September 2, 1944. Laiho (English Wikipedia entry | Finnish) was conscripted to the Finnish Navy to fight in Finland’s theater of war against the Soviet Union. As a Communist himself — Laiho had been imprisoned in the 1930s for his labor agitation — Laiho inclined better to the cause of the other side, and fled to the woodlands near Turku where he gathered intelligence to pass to the Soviets and aided other war deserters. He spent the best part of two years winding towards his date with a military police firing detail after being arrested in December 1942. While Olavi Laiho was the last Finn executed in Finland, on September 2, 1944, a trio of Soviet paratroopers caught behind Finnish lines were shot as spies on September 3, 1944. Those three men are the last ever put to death in Finland. Laiho doesn’t technically have the distinction of being the last in all of Finnish history, but he’s the one remembered as the milestone moreso than the Russian paratroopers. Laiho is the last one of the Finns’ own, the last who emerges as an individual with a fate that speaks to the fate of his countrymen in those times. “Through Olavi Laiho, we empathize with the with the story of the first half of the 20th century,” this dissertation put it. Readers with Finnish proficiency might enjoy the Laiho biography En kyyneltä vuodattanut (I Never Shed a Tear).